The NSW Government Office of Environment and Heritage (OEH) have launched a new initiative to help equipment owners better understand the impact of their refrigeration system on operating costs. 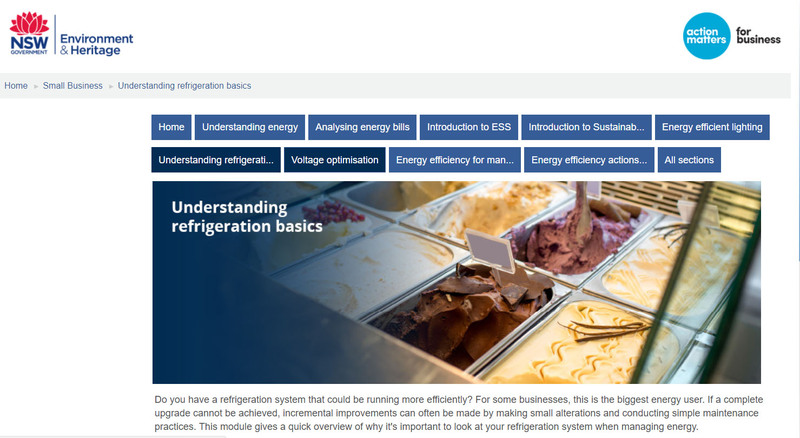 The initiative includes an on-line tutorial titled “Understanding Refrigeration Basics”, and covers topics such as refrigeration system types, compressor types and refrigerant selections. It offers tips to improve energy efficiency such as keeping condenser coils clean and scheduling regular system maintenance. • Assistance with procurement, including tender reviews and engineering design review. Heatcraft Australia is proud to offer an extensive Kirby equipment range for equipment owners looking to upgrade current equipment, replace old equipment or start from scratch. 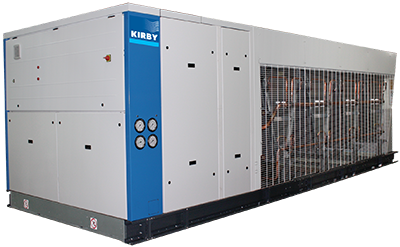 All Kirby equipment offers maximum system efficiency through advanced technologies and is supplied ready to install for simplified installation. A big thank you to everyone who came to visit us at the Heatcraft stand at ARBS 2018 in Sydney. Take a look at our Stand Slideshow or Video and contact your Account Manager for more information on any of the products or services featured. Heatcraft Australia is your HVAC&R Business Partner. Our business offers the broadest and most complete range of Refrigeration & HVAC Equipment, Refrigerant and Parts and our customers are supported technically and logistically by a nationwide wholesale network that continues to grow. At ARBS 2018, Heatcraft will showcase new releases across all categories including the new Kirby Multiwave Outdoor Multi-Compressor Condensing Unit, which offers the cold storage segment an entry level CO2 refrigeration solution that can deliver a 30% saving across the refrigeration plant costs. You’re invited to view new innovations from the Lennox HVAC portfolio and discuss the opportunity to grow your business by being part of the Lennox Premier Dealer network. For more information visit us at Stand 3152. DALLAS, March 14, 2018 /PRNewswire/ -- Lennox International Inc. (NYSE: LII) today announced the planned sale of its Australia, Asia, and South America businesses as the company streamlines its Refrigeration portfolio to focus on its strong market position in North America and Europe. For the sale of the Australia and Asia businesses, the company has signed a binding agreement with Beijer Ref AB. The transaction is expected to close in the second quarter of 2018. Separately, Lennox International is in the process of selling real estate in the Sydney area formerly related to its business operations there. For the sale of the South America business, the company is far along in the process and expects that transaction to be concluded in the second quarter of 2018 as well. In total, the businesses being divested contributed $187 million in revenue and $6.4 million in profit to the company's Refrigeration segment in 2017. Beginning with the first quarter of 2018, these businesses will be designated as non-core and excluded from the company's core adjusted revenue and earnings reported each quarter. Adjusted revenue and earnings in the corresponding prior-year period also will be updated for this move. Off the lower 2017 base from these divestitures, Lennox International reiterates 3-7% revenue growth guidance for 2018 and EPS from continuing operations of $9.75-$10.35. The company is raising its 2020 margin target for the Refrigeration segment from 12-14% to a new range of 14-16%. Total net proceeds from the transactions are broadly estimated to be approximately $110 million. With strong cash generation, Lennox International will continue to invest in the organic growth and profitability of its Residential and Commercial HVAC businesses as well as Refrigeration, grow dividends with earnings over time, and repurchase company stock. "Divesting the Australia, Asia, and South America refrigeration businesses will enable us to focus even more on North America and Europe, where we have significant opportunities and strong market positions," said Lennox International Chairman and CEO Todd Bluedorn. "Our strong refrigeration brands, innovation, and leadership in equipment and advanced controls, position us well to drive growth and margin expansion in our Refrigeration business as we look ahead." Additional information on Lennox International – including 2017 revenue and profit by quarter for the Refrigeration businesses being divested – is available at www.lennoxinternational.com. Lennox International Inc. is a global leader in the heating, air conditioning, and refrigeration markets. Lennox International stock is listed on the New York Stock Exchange and traded under the symbol "LII". Contact: Steve Harrison, Vice President, Investor Relations, 972-497-6670. "Safe Harbor" Statement under the Private Securities Litigation Reform Act of 1995: Statements in this press release regarding Lennox International's business which are not historical facts are "forward-looking statements" that involve risks and uncertainties. Examples of forward-looking statements include the expected net proceeds from these planned dispositions and the anticipated timing of the transactions. Important risk factors relating to these dispositions include (a) the risk that the closing conditions (including regulatory approvals) for the sale of the Australia and Asia businesses are not satisfied or delayed, and (b) the ability to enter into definitive agreements and close transactions to sell the South America business and the real property in the Sydney area. For a discussion of other risks and uncertainties, which could cause actual results to differ from those contained in the forward-looking statements, see "Risk Factors" in the Company's Annual Report on Form 10-K for the most recently ended fiscal year. Please be advised that we will now be updating you on future price increases via the Heatcraft website www.heatcraft.com.au in AU and www.heatcraft.co.nz in NZ. The next price change will take effect from the 1st of January 2018. We thank you for your continued support and assure you that Heatcraft appreciates your business and we are committed to continually making improvements that add value to your business.